Tell us what you think about our website by completing a short Survey. If a taxpayer mailed a tax payment to the Tax Collector or scheduled an electronic payment (i.e. 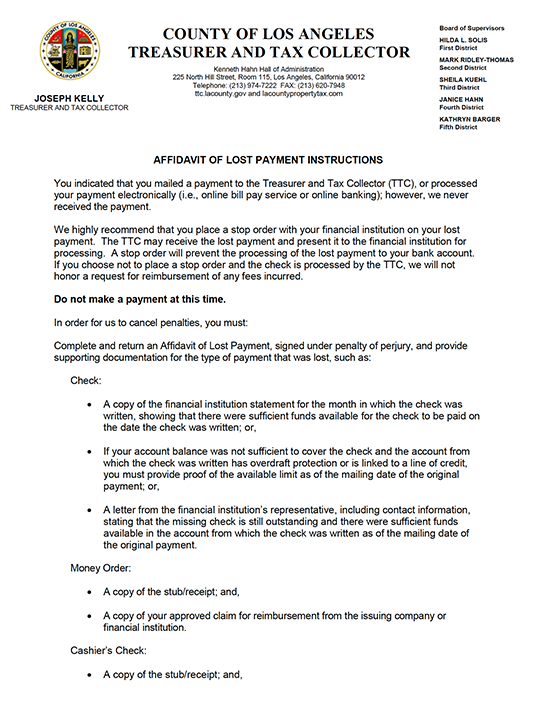 online bill pay service or online banking) and our records indicate we never received it, in order for us to consider your request to cancel penalties, please read the Affidavit of Lost Payment Instructions, complete the Affidavit of Lost Payment and submit any supporting documentation. You are now leaving the County of Los Angeles Treasurer and Tax Collector website and linking to a website that may contain commercial advertising. The County of Los Angeles Treasurer and Tax Collector does not endorse or support any of the advertising that may be contained on this site. 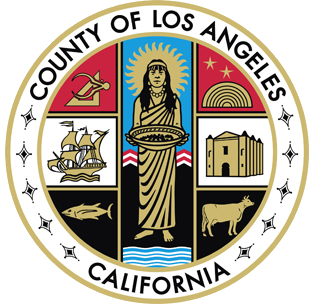 The County of Los Angeles Tax Collector has requested publication of the Online Auction Notice, required pursuant to California Revenue and Taxation Code Section 3702, in the following newspapers, on the days noted. The list of the newspapers and the dates are provided below. If January 1st, July 4th, November 11th, or December 25th falls upon a Saturday, the preceding Friday is a holiday. If January 1st, July 4th, November 11th, or December 25th falls upon a Sunday, the following Monday is a holiday. A person designated by the decedent who inherits under a Will. The person responsible for overseeing the distribution of the estate, and may also be referred to as the “Personal representative”. A written claim filed by a person or entity owed money by a decedent. The Los Angeles Superior Court, Probate Division. The individual who has the physical possession of the Will when the individual who wrote the Will dies. All the property (home and/or personal effects) that a person owned at the time of death. A person named in a Will and appointed by the Court to carry out the decedent’s wishes written in the Will. A person recognized by law, who inherits when there is no Will. The distribution of a particular asset to a beneficiary. When someone dies without leaving a Will. The order in which heirs inherit the decedent’s estate when a person dies without a Will. Persons who have requested notice for Court proceedings for an estate administration. This is another term for Beneficiary. Family members, who are in the closest relationship to the decedent. Items owned by the decedent at time of death, such as cash, stocks, jewelry, clothing, furniture, or cars. Individual(s) responsible for overseeing the distribution of the estate. The individual(s) may also be called the Administrator(s). The legal process of deciding where, how, and to whom to distribute the decedent’s estate, supervised by the Court and generally applies to decedent estates with a value exceeding $150,000, at the time of death. A branch of the Department of the Treasurer Tax Collector for Los Angeles County, responsible for investigating, managing, and administering certain cases of deceased Los Angeles County residents. Buildings and land, including the residence owned by the decedent at the time of death. Transfer of a decedent’s assets without Court supervision. Summary proceedings are only conducted by the Public Administrator, with limited or no Court supervision, where the total value of the decedent’s estate does not exceed $150,000. When someone dies leaving a Will. When a person (trustee) holds property at another person’s (settlor’s) request for the benefit of someone else (beneficiary). A legal document that lists a person’s wishes about what will happen to his/her estate after death. The annual bill, which includes the General Tax Levy, Voted Indebtedness, and Direct Assessments, that the Department of Treasurer and Tax Collector mails each fiscal tax year to all Los Angeles County property owners by November 1, due in two installments. A bill that replaces the Annual Secured Property Tax Bill due to the following reasons: a change or correction to the assessed value of the property; the allowance of an exemption that was previously omitted; the correction of a Direct Assessment placed on the property from a municipality or special district; or the inclusion of a penalty for failure to comply with certain requirements of the Office of the Assessor prescribed by law (this excludes a penalty resulting from a delinquent payment). “According to the value” – Based on value. For example, the Office of the Assessor calculates property taxes based on the assessed value of a property. The rate or value of a property for taxation purposes. A 10-digit number (a.k.a., map book, page, and parcel) that identifies each piece of real property for property tax purposes, e.g., 1234-567-890. A telecommunications relay service that provides full telephone accessibility to people who are deaf, hard of hearing, or speech impaired. A document that provides the closing details on a real estate transaction including the escrow deposits for property taxes, commissions, loan fees, points, hazard insurance, and mortgage insurance. Also called HUD-1 Settlement Statement or Settlement Sheet. The current fiscal tax year in which the Department of Treasurer and Tax Collector issues an Annual Secured Property Tax Bill. The assessed value the Office of the Assessor assigns to a property. The estimated resale value of a property. Each current year installment payment that is past due. The unpaid property taxes at the end of the fiscal tax year. The costs of services or benefits (e.g., weed removal, landscape, flood control, refuse, sewer, sidewalk repair, and lighting) that the Department of Auditor-Controller adds to the Secured Tax Roll at the request of local taxing agencies. An electronic form of payment made via the Internet that is designed to perform the same function as a conventional paper check. A taxable or an assessable prior year event that escaped the Office of the Assessor, which as a result, was not added to the corrected property’s assessed value to the prior year Annual Secured Property Tax Bill. A contractual arrangement in which a third party (title company or escrow company) receives and disburses money or documents related to the sale of a property. A statement with the breakdown of credits, debits, and payments for the buyer and the seller at the closing of a real estate transaction. A protection or exclusion on a portion of property taxes. A fiscal tax year runs from July 1 through June 30; a tax roll year refers to the fiscal tax year. For example, Fiscal Tax Year 2018-19 runs from July 1, 2018 through June 30, 2019, and the Tax Roll Year is 2018-19. A five-year payment plan that allows defaulted property taxes to be paid in 20 percent increments of the redemption amount, with interest, along with the current year property taxes annually. A four-year payment plan that allows prior year escaped assessments to be paid in 20 percent increments of the escaped property taxes, without penalties or interest, along with the current year property taxes annually. An account a taxpayer establishes with his/her lender to pay property taxes. The documentation required for military personnel to apply for relief of property tax penalties. To make an electronic payment for property taxes via the Department of Treasurer and Tax Collector’s website. This is not a payment through your bank’s online bill payment or home banking functions. A numerical code necessary for completing electronic financial transactions. The PIN can be found on any original Secured Property Tax Bill. A United States Postal Service (USPS) marking on an envelope or package that indicates the date and time a mail piece was taken into custody by the USPS. Please visit https://ttc.lacounty.gov/avoid-penalties-by-understanding-postmarks/ for samples. The property taxes that have defaulted or escaped during the prior fiscal tax year. A State program offered to senior, blind, or disabled citizens to defer their current year property taxes on their principal residence if they meet certain criteria. An auction, held pursuant to the California Revenue and Taxation Code Section 3691, in which the Department of Treasurer and Tax Collector auctions and sells tax-defaulted properties in its possession. The rate or value of a property when a change in ownership or completion of new construction occurs. A taxpayer’s request to be excluded from reassessment of the value of a property after meeting certain conditions (e.g., transfer of property from parent/grandparent to child/grandchild or transfer of base year value). A form to request information on multiple properties all at once. A charge for processing all credit/debit card transactions for property tax payments. A replacement bill used for making property tax payments on lost or missing original bills. This bill does not contain the Personal Identification Number or a breakdown of the General Levy, Voted Indebtedness, or Direct Assessments. An additional property tax bill issued as a result of the reassessment of the value of a property upon a change in ownership or completion of new construction. A tool to estimate the expected amount of Supplemental Secured Property Taxes on a recent purchase of property. Please visit https://assessor.lacounty.gov/supplemental-tax-estimator/. An event that requires the Office of the Assessor to assess or reassess the value of a property (e.g., change in ownership or completion of new construction). A local agency within a specific tax rate area (e.g., schools, fire, water, parks, districts, departments, community services, etc.). A telecommunication device such as a teleprinter that is designed for people who have hearing or speech difficulties. A Los Angeles County contracted vendor that processes all credit/debit card property tax payments. We only accept U.S. funds drawn on U.S. based financial institutions. Before you click the button, check the bank routing number and the bank account number to make sure you have entered each correctly. If either or both numbers are wrong our bank or your bank may not honor the electronic payment and return it to us unpaid. To avoid penalties, costs, and a returned transaction fee, please double-check the data before submitting the payment. An identifying number assigned to the taxpayers for the annual, supplemental, and escape assessment taxes. The bill number is on the tax bill. The year the taxes are added to the tax roll. Two years of tax information is available on the web site from approximately March thru June 30 of each year. Property tax payments must be received, or United States Postal Service (USPS) postmarked, by the delinquency date to avoid penalties. Otherwise, the payment is delinquent and penalties will be imposed in accordance with State law. If the 1st installment is delinquent, a 10 percent penalty is imposed. If the 2nd installment is delinquent, a 10 percent penalty plus a $10 cost is imposed on the 2nd installment. For example, if the amount due for the 1st installment is $2,000, a 10 percent penalty of $200 will be imposed. If the amount due for the 2nd installment is $2,000, a 10 percent penalty of $200 and a $10 cost (total $210) will be imposed. POSTMARKS are imprints the USPS applies to letters, flats, and parcels to reflect the date, name, state, and zip code of the USPS office that accepted custody of the mail. The postmark is generally applied, either by machine or by hand, with cancellation bars and is primarily used to prevent postage from being re-used. Taxpayers who send their payments by mail are cautioned that the USPS only postmarks certain mail depending on the type of postage used. Additionally, the USPS may not postmark mail on the same day it is deposited by a taxpayer. STANDARD POSTAGE STAMPS: Stamps purchased and affixed to mail as evidence of the payment of postage. 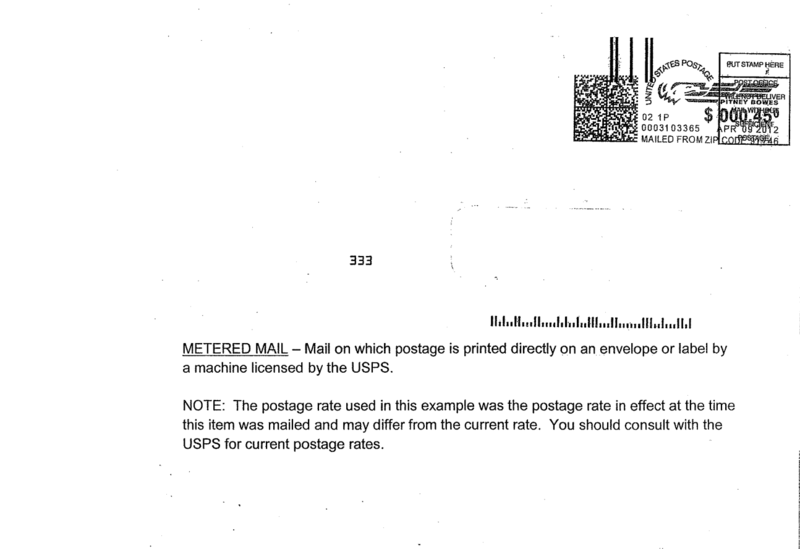 METERED MAIL: Mail on which postage is printed directly on an envelope or label by a postage machine licensed by the USPS. Many private companies use these types of postage machines. 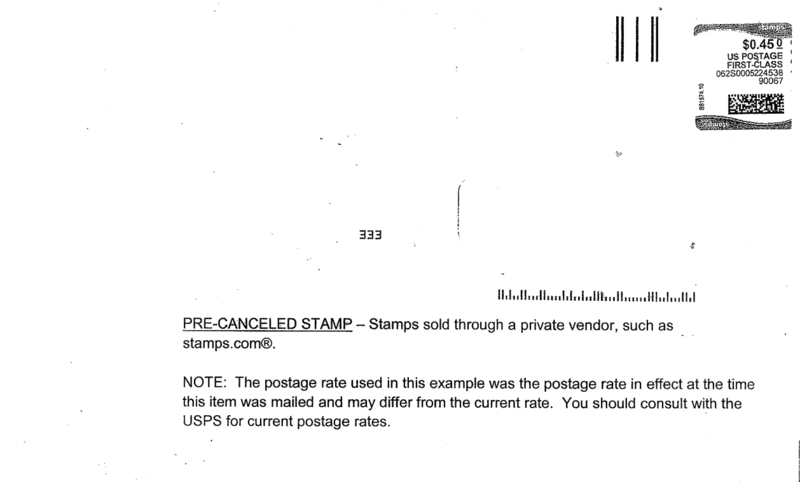 PRE-CANCELED STAMP: Stamps sold through a private vendor, such as stamps.com®. 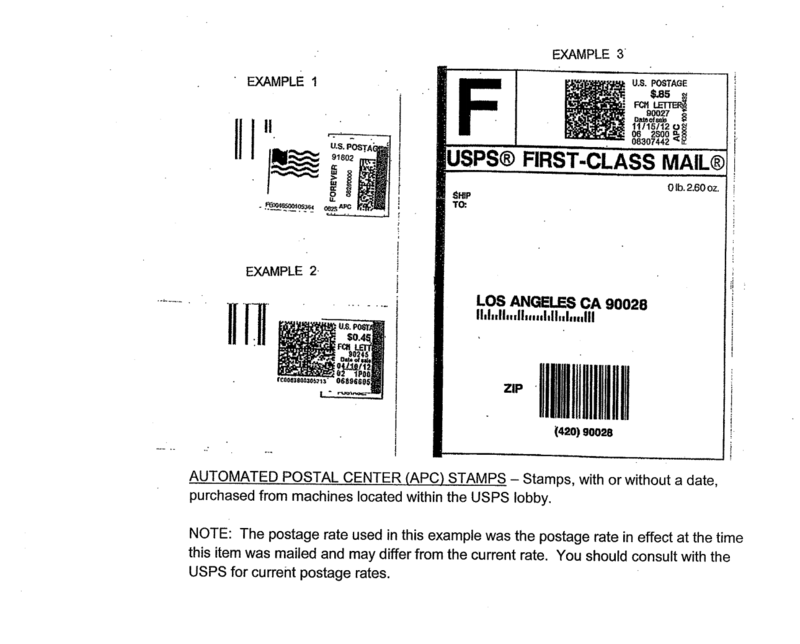 AUTOMATED POSTAL CENTER (APC) STAMPS: Stamps, with or without a date, purchased from machines located within a USPS lobby. 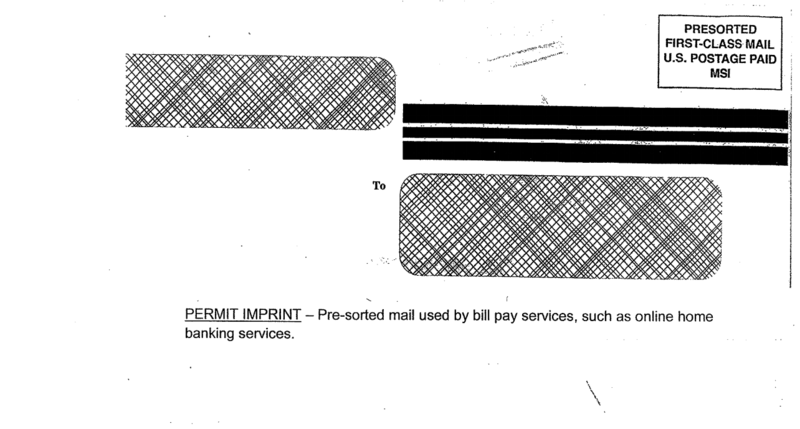 PERMIT IMPRINT: Pre-sorted mail used by bill pay services, such as online home banking. 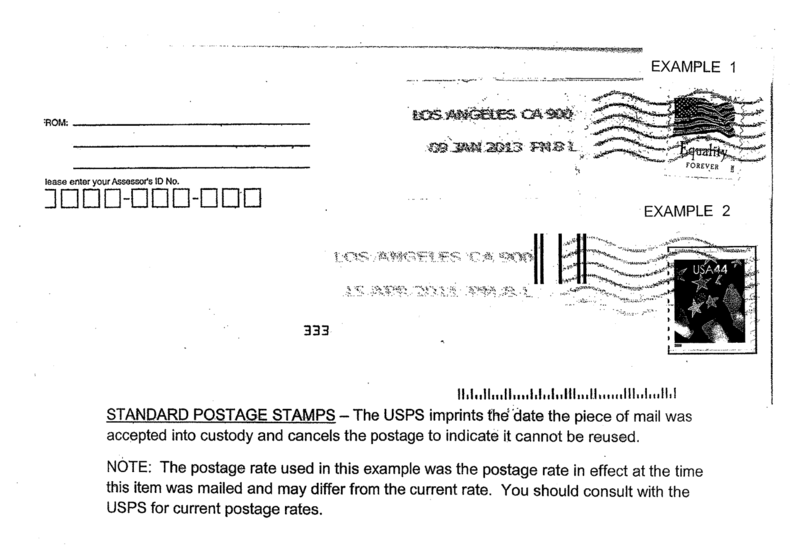 If you use these types of postage, the USPS will not postmark your mail. We will impose a 10 percent penalty and a $10 cost, if applicable, if we do not receive your mailed payment by the delinquency date. Purchase a POSTAGE VALIDATED IMPRINT (PVI) Label from a USPS retail counter or window. 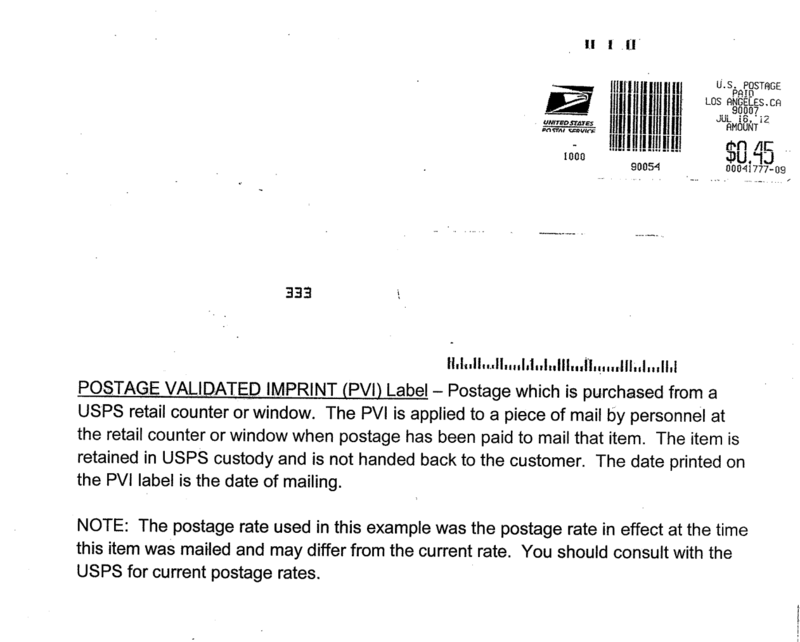 The PVI is applied to a piece of mail by personnel at the retail counter or window when postage has been paid to mail that item. The item is retained in USPS custody and is not handed back to the customer. The date printed on the PVI label is the date of mailing. SAVE MONEY! SAVE TIME! PAY ONLINE! Electronic payments can be made 24 hours a day, 7 days a week and payments are accepted until 11:59 p.m. Pacific Time on the delinquency date. ✓ You will no longer have to worry about mail delays or post office closures. ✓ You will no longer write a check, look for stamps, or travel to a mailbox. Pay online for free using your checking account and the Personal Identification Number (PIN), which is printed on the Annual Property Tax Bill. Each electronic check transaction is limited to $999,999.99. To make a payment now, go to Make Online Payment. You may also pay online by using a credit card (American Express, Discover, MasterCard, or Visa) or Visa Debit card. However, there are processing fees when paying by credit/debit card. Each credit/debit card transaction is limited to $99,999.99, including all service fees. Electronic payments can be made 24 hours a day, 7 days a week and payments are accepted until 11:59 p.m. Pacific Time on the delinquency date. To make a payment now, go to Make Online Payment.